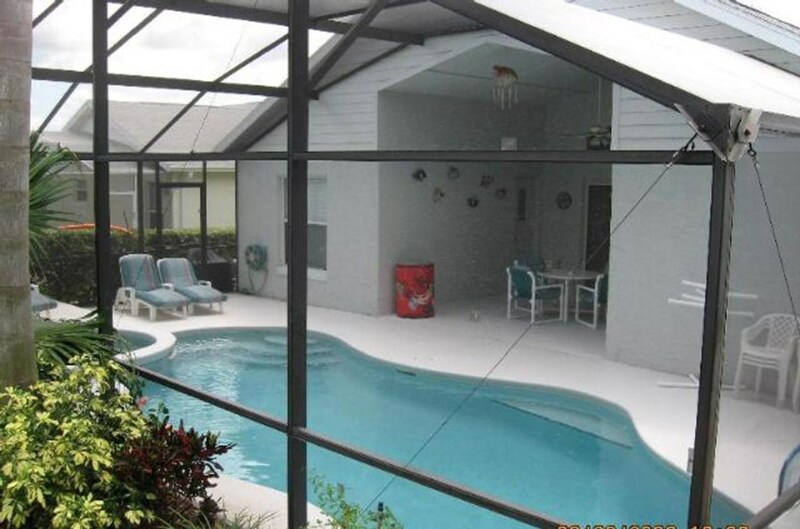 Relaxing 4 bed vacation pool home with awesome game room! All new tiled floors, Luxurious vanities, and the large shower now has a beautiful frameless glass enclosure. Has to be seen to be appreciated. The High vaulted ceilings and an open floor plan make this home feel like one continuous room, with enough seating for everyone and enough room for everyone to be comfortable. 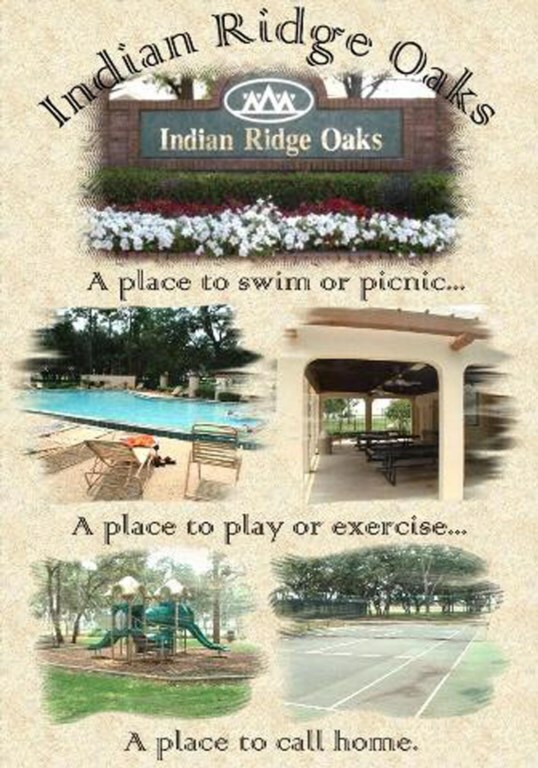 The upgrades to Sunny Oaks are countless! The first and most obvious is shiny and sleek, new 50” TV in the living room, accompanied by a Blu ray DVD player, a VCR, and an AM/FM stereo + CD player, and a wide array of DVDs to pick from. Spaciousness is a re-occurring theme here, as the pool backs up to a conservation area, and provides swimmers with the personal space they desire when swimming and soaking up the Florida sun. A TV out by the pool makes the patio a space where people can sit, enjoy a meal on the BBQ and watch their favorite shows. 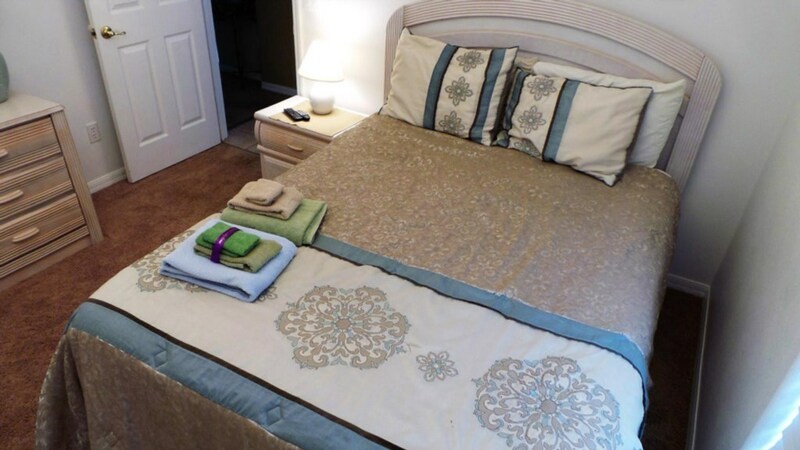 The master bedroom has been completely refurnished, from floor to ceiling. The walls have been repainted in a rich golden brown, the King size pillow top mattress is state of the art, and there is a brand new 32” TV. The new bedding will have you asleep before your head hits the pillow. This does not feel like a “vacation home master bedroom;” it feels like home. It overlooks the pool and has a big walk in closest! The master bathroom has recently been totally upgraded, with beautiful tiled floors, brand new vanity units, and the large shower now has frameless glass enclosures. It offers a huge walk in shower and heart shaped two. Once again, more than enough space to move about the master suite. Kids will find their own space in the game room, equipped with a pool table, dart board, play kitchen and plenty of toys to occupy them for hours. The game room doubles as a fitness center as well, so you can burn off some extra calories using the fitness bench and elliptical machine! 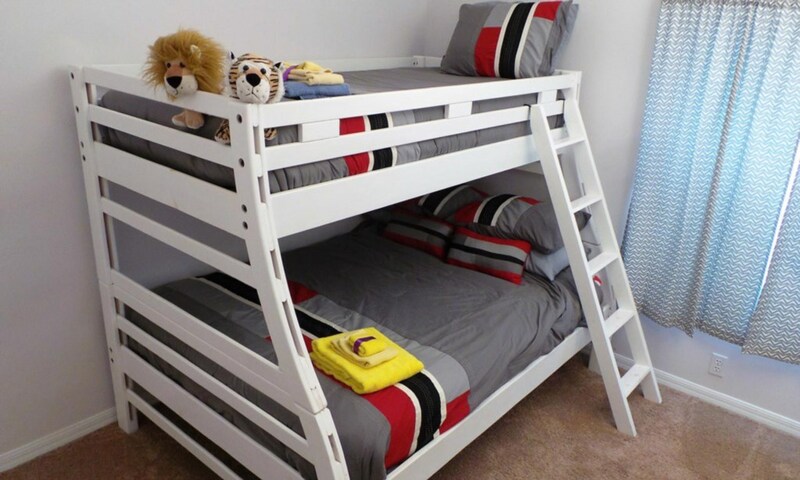 The second bedroom has a queen size bed with a pillow top mattress, and the third bedroom has twin beds, and the fourth bedroom has a bunk bed with a twin on top and a full on the bottom. All bedrooms have a TV, so no need to fight over what to watch, there are plenty of TVs for everyone! 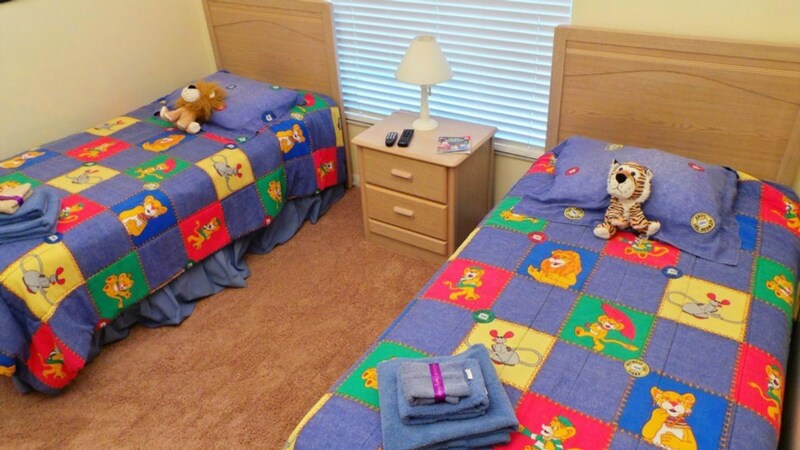 Close to Disney, clean, comfortable and newly and constantly being upgraded, Sunny Oaks Pool Side is top of the line when it comes to luxury vacation homes. So make some space on your calendar for a vacation your family will remember forever, and reserve Sunny Oaks Pool Side today! The house is beautiful and the pool was lovely. 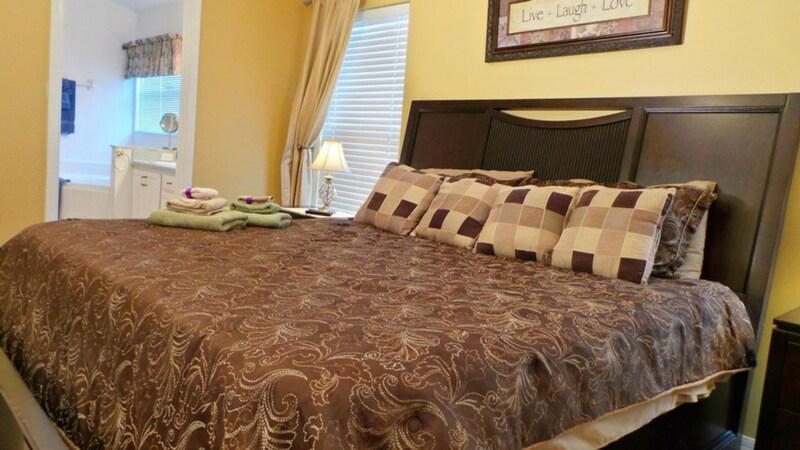 Excellent location within a 10 minute drive of all Disney attractions. Extremely quiet neighborhood with lots of privacy. Home was extra clean, had a lot of great ammenities, and our host very accommodating to special requests. Great house in a very convenient location. 10 minutes to the transportation ticket center at Disney or 20 minutes to Universal. The pool is fantastic with enough privacy from the neighbors and empty space directly behind the property (golf course in the distance). Bedrooms were nicely done and mattresses were comfortable. Master bath was very new and walk in shower was great, guest bath is in need of some small improvements (water pressure in showers very low). Kitchen had all the essentials and the living room was very nice. Entertainment system was nice, furniture very comfortable and the games in the unifnished garage were a nice bonus (pool table, darts and foosball). Overall this was a great house to stay in and I would definitely return. We recently stayed here for 2 weeks - great house and great pool! The house is well set out with plenty of room which was an asset as the whole family were renting the two houses next door! 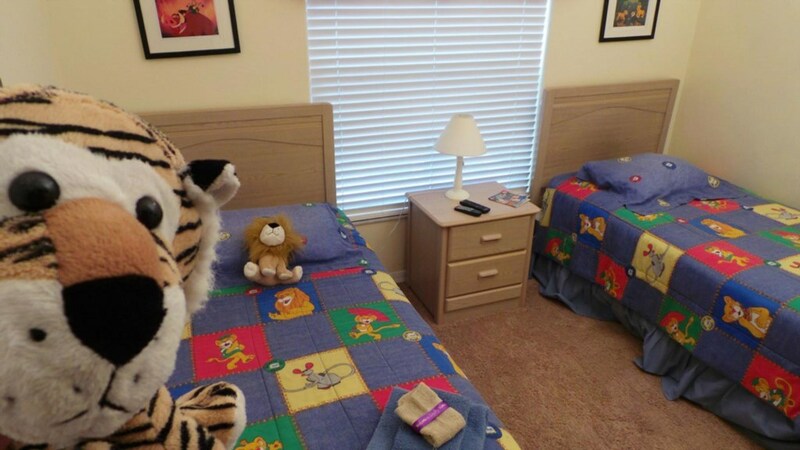 The location is quiet but great privacy and absolutely no problems whatsoever. Very helpful team at Loyalty, we asked for the pool heat to be turned on and it was done by the time we returned from a day at Disney. 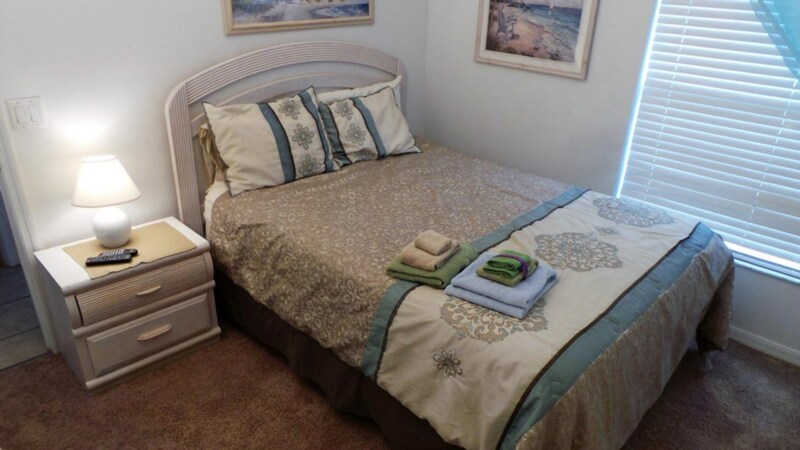 The location is very convenient for the parks, no more than 10 minutes away! Also convenient for the main Interstate which took us to pretty much everywhere we wanted to go. Would highly recommend, the pool/spa was fantastic, had a great time swimming day and night (once the heat was on)! Thoroughly enjoyed the trip and would go back in an instant! We have stayed with Loyalty Homes in the past, but this was the first time staying in this home. It was very pretty, well kept home. Everything was perfect for our stay. I traveled with my mom and she found it so much easier to be in a home for going in and out, without the worry of crowds, stairs and elevators that come with hotels. 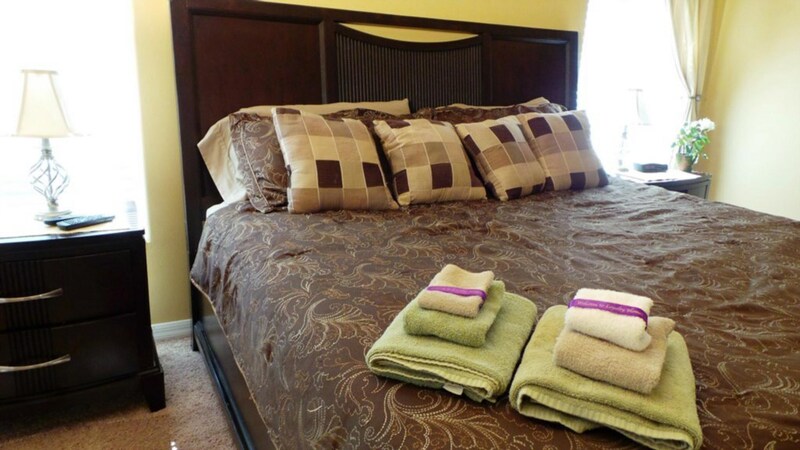 The house was so clean, with updated furniture and dining room set, beds were comfortable. Especially a pet friendly house it was such a comfortable home. The neighborhood was nice and quiet with friendly neighbors. Having a TV outside was such an added bonus while enjoying the patio and pool. The kitchen was fully stocked and having some start up supplies helped so we didn't have to run right to the store soon as we got to the house. The staff was very polite and helpful, from making reservations to talking with Marc, the pool guy. Disney’s maingate is 10 minutes away, local food stores, restaurants minutes away. Also, we used I-4 to route 429 which was 2 minutes away, this was nice if you want to avoid 192 traffic, but just have quarters since it’s a toll road and there are no attendants. The only thing was the site said it had a grill which we didn’t see. The back yard was nice and private. Most of the houses in these developments have another house facing your backyard. This house has a grassy backyard and trees bordering the yard to make it more private. We would definitely stay here again and would highly recommend it!! Better then any 6 Starr Hotel. We will Refer this HOUSE to any one that is going to Kissimmee Florida area .